Why it’s daunting: Despite the critical beatification of The Velvet Underground—whose every record with Lou Reed is widely and rightly hailed as essential, hence the band’s exclusion from this Gateway—Reed has gone on to create a vastly uneven and self-contradicting catalog. Glam, rock opera, new age, noise: Over the last 40 years as a solo artist, he’s done it all. And with the curmudgeonly songwriter soon collaborating with Metallica, he’s about to add metal to his résumé. (Though it could be argued he stuck his toe in the genre on his riff-heavy 1974 live album, Rock ’N’ Roll Animal.) Of course, Reed’s wide swings in style and quality sometimes take place within a single album, making the man’s magisterial croak and mythic aura that much tougher for newcomers to decode. 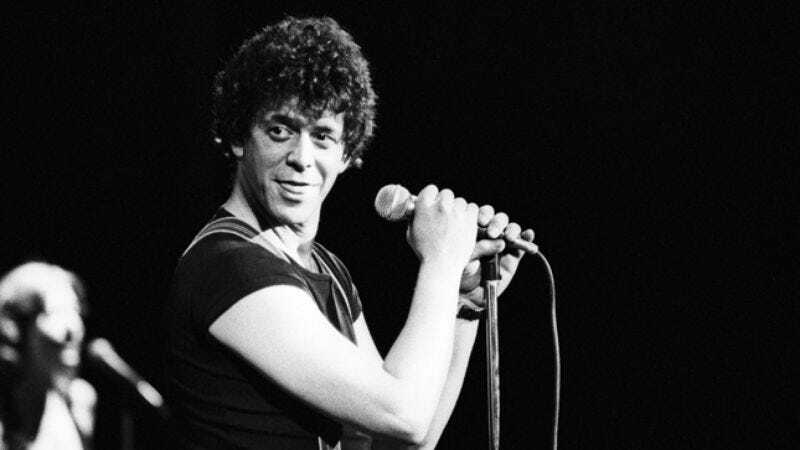 Why: After leaving The Velvet Underground to shamble on without him in 1970, Lou Reed released his self-titled solo album in 1972—an inauspicious debut that did little to distinguish him from his former band, consisting mainly of reworkings of unreleased VU songs. Granted, Transfomer—also released in 1972—contains four songs that date from Reed’s VU days. But the production by David Bowie and his fellow Spider From Mars Mick Ronson pushes Transformer into another place entirely. Lean, hard-edged, and dynamic, the album is breathlessly thrilling. Some of its most striking moments, though, are its quietest—including the haunting “Perfect Day,” one of the most recognizable songs in Reed’s entire catalog. That Transformer also contains two more of Reed’s most indelible songs—the punky “Vicious” and the fluke radio hit “Walk On The Wild Side”—makes the disc that much better a hook for the uninitiated. Next steps: Where Transformer is tight, punchy, and perversely pop-oriented, its 1973 follow-up Berlin is sprawling and difficult. But not off-puttingly difficult. The album’s dense orchestration and gloomy narrative arc have an entrancing, narcotic allure, and even Reed’s vocals—long criticized by detractors for being too speaky—are at their most organic, sensitive, and melodic. After the critical razzing Berlin received on its release (a consensus that’s since seen a complete reversal), Reed released the excellent, hard-edged Sally Can’t Dance and his famed—or infamous—noise opus, Metal Machine Music. But in 1975 he hit a sweet spot with Coney Island Baby. For the first time in his career, Reed was breaking zero new ground, but Coney’s crystalline production and succinct songwriting finds him comfortable, for once, in his own skin. The result is an album that’s as accessible, even confessional, as it is true to Reed’s oft-cruel worldview. As if in response to the transformation of the New York punk scene from visceral rock to cerebral abrasion, Reed put out The Blue Mask in 1982. Austere and uncompromising—and featuring the droning, angular guitar of the late Robert Quine—the album is one of Reed’s most timeless. It’s hard not to hear protean strains of Sonic Youth in songs like the searing title track, which also features one of Reed’s most harsh and unhinged lyrics since VU—only here, he bleats with a harrowing, magisterial sternness. Alternative rock was starting to break into the mainstream in the late ’80s, and almost every band making such inroads cited Reed as an influence. Reed responded with New York. The 1989 album is gritty and full-blooded, with an almost Springsteen-like air of authority and authenticity that elevates Reed’s typical gutter poetry into distorted, eroded folk-blues. That is, when it isn’t flat-out rocking. It also set the pace for Reed’s solid, if middle-of-the-road, output throughout the ’90s. Where not to start: As a rule of thumb, it’s best to dive into every other decade of Reed’s solo output when starting out—that is to say, the ’70s and ’90s are generally decent, while the ’80s and the ’00s are spottier. Of course, exceptions abound (some of them noted above), and even his worst albums have a hidden gem or two. Still, discs like 1986’s sterile, clunky Mistrial—notorious for its disastrous rap experiment, “The Original Wrapper”—aren’t going to win any converts. And his inconsistent, post-millennial dabbling in Edgar Allan Poe adaptations (2003’s The Raven) and Tai Chi soundtracking (2007’s Hudson River Wind Meditations) are also best saved for veterans of Reed’s sonic wars. Then there’s Metal Machine Music. Described glowingly by Lester Bangs as music for “mutants, mental patients, shriek freaks, masochists, sadists, amphetamine addicts, hate buffs, [and] drug-numbed weirdos too walled off by chemicals to feel anything,” MMM has become one of popular music’s most notorious attempts at commercial suicide (and some might say homicide). Reed, of course, refutes that—but there’s no denying the album’s glorious insanity. More than an hour long, it features four instrumental tracks of carefully layered and modulated guitar feedback, none of which concede an inch to conventional melody or songcraft. That said, the album has gone on to influence countless experimental noise and drone projects—and depending on your personal taste and tolerance for pain, it can be a thing of perverse, piercing beauty.